While I was compiling the best options, my friends at OPELLE kindly sent me the Mindy Tote to try out. This was my the exact one from my wish list and while there was no obligation to post about it, I do think it’s a great option and have included my thoughts after testing it out for a little while. So let’s take a look at 10 tote bag options I’ve found! They’re all beautifully designed, responsibly made, ranging in price from $32 USD – $395 USD and there are several vegan options too! The leather is soft but sturdy and pebbled for easy cleaning and maintenance. 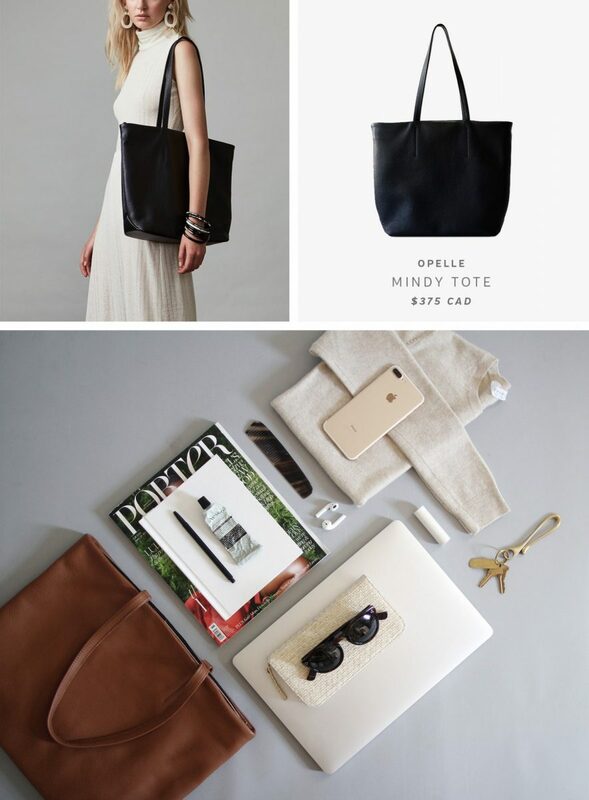 OPELLE hand selects every piece of leather they use and it is always absolutely gorgeous! It is scratch, stain & water resistant and very durable, despite it softness. 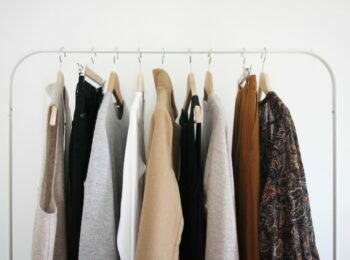 I really like the long handles because they easily glide over wider sleeved sweaters and coats. The width is just wide enough to not dig into the shoulder when the bag is heavy but still slim enough to give the bag a refined feel. 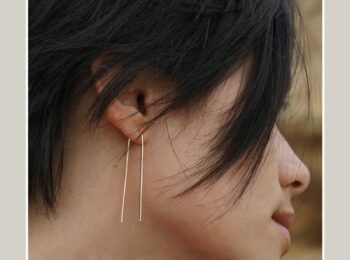 The gold zippers are durable and glide easily, while most brass zippers tend to stick at first. The base of the bag is flat and reinforced so the bottom stays straight and flat even with heavy items inside. This also makes it easy to set on the floor. There are two small pockets and a larger interior zip pocket, all of which help to keep the contents organized and yet still accessible. My 15 inch laptop slides in easily (horizontally only). Ideally there would be a built-in laptop sleeve within the bag so that the computer would be protected from hard elements like zippers, keys and spiral binding on notebooks etc. As is, I’m able to protect it by putting a notebook or sweater on either side but it takes some strategic packing. It would be great if Mindy was structured enough to stand on its own without needing to lean on anything. However, that might change the look and feel of it overall and I like that its not too stiff or boxy. 3 colours available. Shown in Tobacco. Care: Pebbled cowhide is a finished leather tanned with a sheer protective topcoat and needs very little care to maintain. To prevent damage to the protective finish, care should be taken to avoid road salt, oils & corrosive materials. Most dirt / stains can be removed with a damp cloth or baby wipe. Overall, I definitely think Mindy is a definite keeper! I plan to continue using this bag a whole lot throughout the Fall and Winter. MY THOUGHTS: If I was carrying my laptop and life to and from an office everyday, this would probably be my top choice. 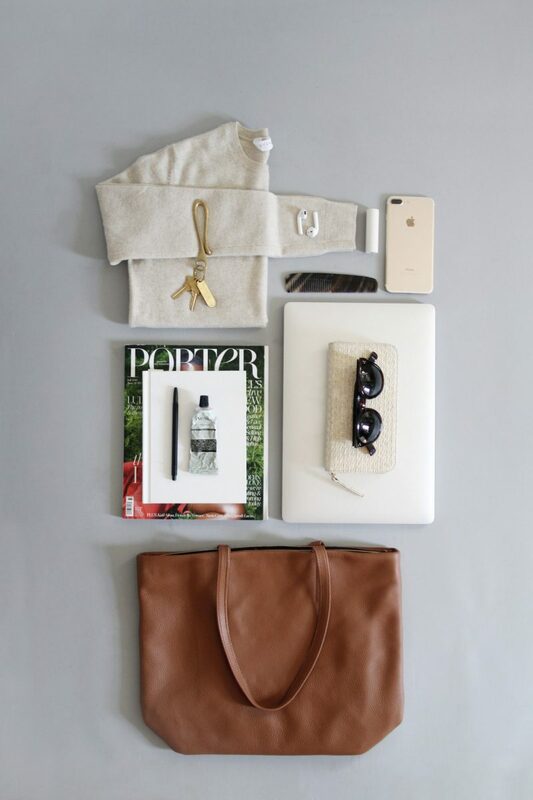 I love the shape of the Trapeze Satchel and it looks elegant and functional without leaning too close to a briefcase. 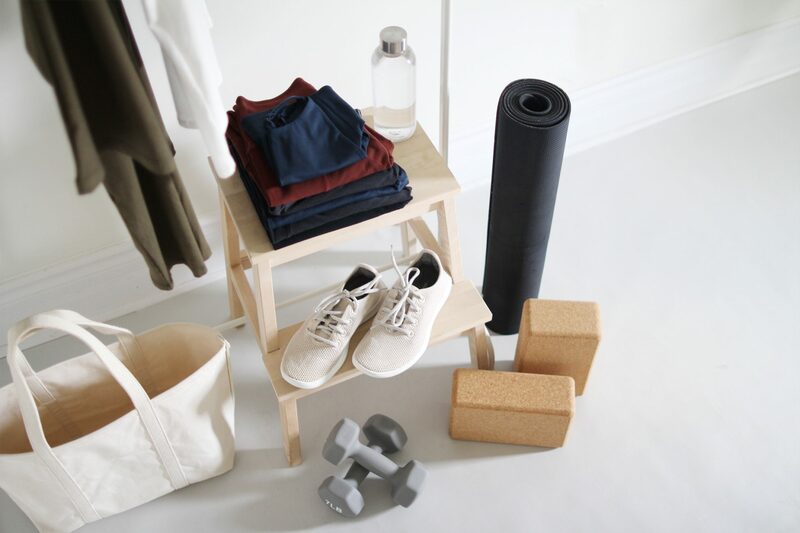 It would also double as a great weekender for short trips and carry-on purposes. Detachable, adjustable cross-body or shoulder strap. 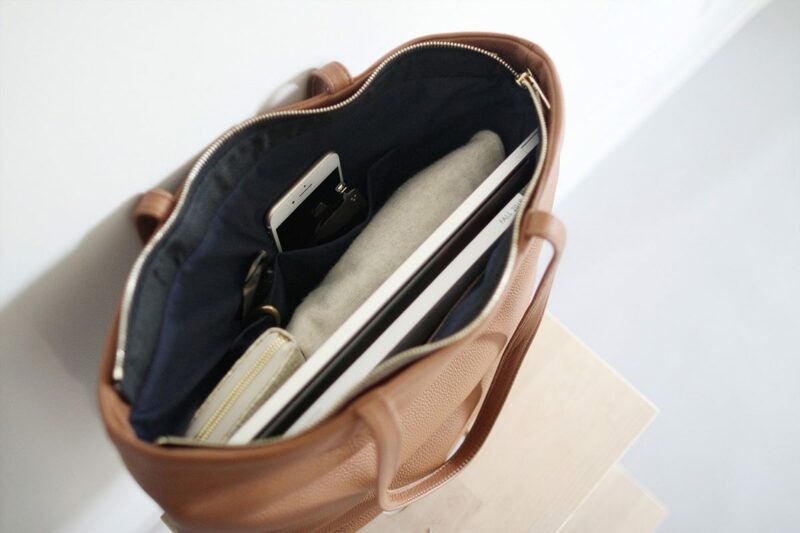 Trapeze Satchel can hold up to a 15” laptop, a water bottle, a wallet, and any essentials you would carry for a day at work. It can also fit a change of clothes with one pair of shoes. Care: For light cleaning, wipe with a damp cloth. For more serious cleaning, please contact a leather cleaning professional. Width at base: 14 in. MY THOUGHTS: We got this bag for my Mum a couple of years ago and she loves it! 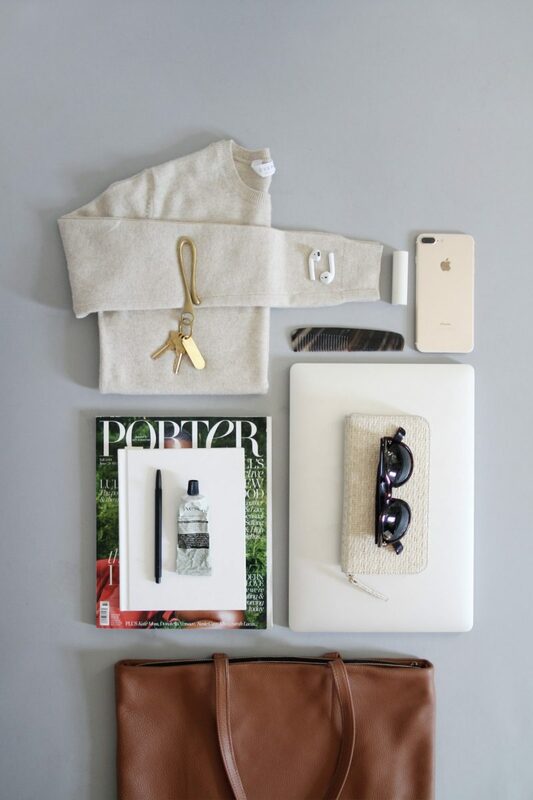 She is the ultimate over packer when it comes to her purse and everything fits easily into the Classic Leather Zip Tote. She’s been using it every day and it still looks like new! Care: For light cleaning, wipe with a damp cloth. 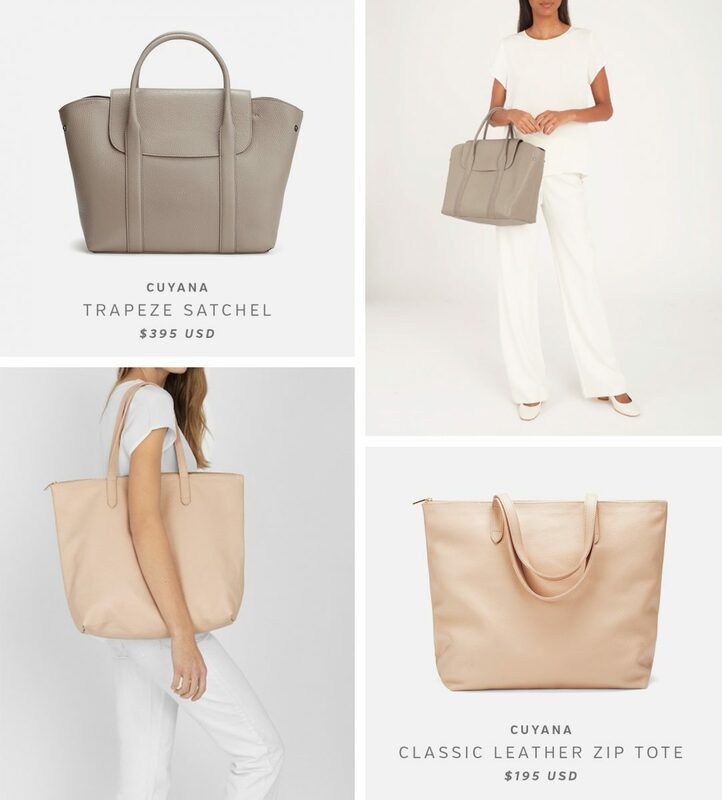 MY THOUGHTS: The shape and proportions of the Cara Tote make me think of Céline and that is an immediate plus. I like how this one is ultra minimal with a sturdy structure and clean lines. The straps look like a great length for sliding over coats and wide sleeves too. Tote bag with dropped channel metal zipper and tail detail. Comes with removable/adjustable crossbody strap. MY THOUGHTS: Knowing myself, that exterior pocket for easy phone access would definitely come in handy. I also think the lines on this bag design are quite aesthetically pleasing. As you can see from the dimensions, it’s quite large, yet, it doesn’t seem huge thanks to the way the seems break it up. Oversized tote with magnetic snap closure. Multiple exterior pockets; large pockets along front and back of bag with magnetic snap closure, and two large slit pockets on sides of bag. Detachable zippered pouch connected by strap. Fits 15” laptop. Interior: Logo-embossed hanging pouch pocket. Pouch Interior: 3 card slots. Can ﬁt a 15” laptop. MY THOUGHTS: The Alem Utility Bag came highly recommended but a few of you and about 70 other 5 star reviewers on the listing. 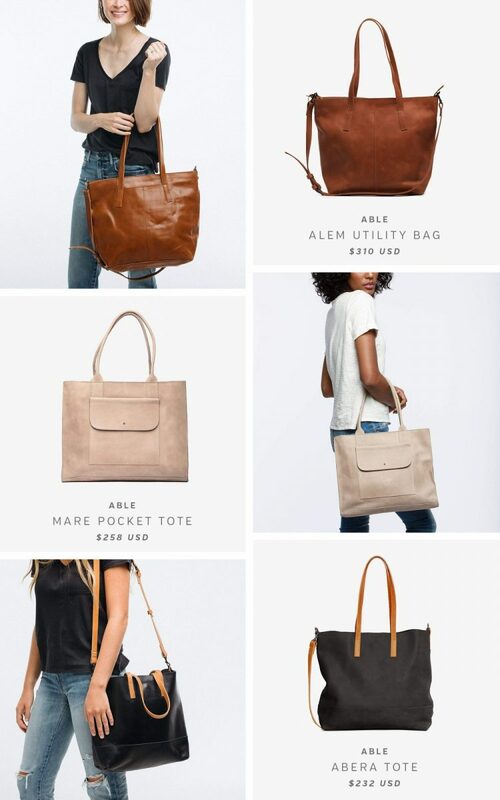 In general, ABLE’s bags have a more casual feel than some of the options I’ve listed above so if that’s what you’re looking for these are a good place to start! Additionally, I’ve had my Thiras Saddle Bag from ABLE for several years and it has held up very well. Interior is fully lined, with a zipper closure, exterior slit pocket, and 3 interior pockets. MY THOUGHTS: I love this simple fabric tote from Baggu. The style has been a staple from the brand for years and it’s a great option for students or folks on a tight budget that would like something a bit more professional than a backpack. There are lots of colour options but I really like the Dark Denim for the fall! MY THOUGHTS: This one doesn’t have a closure so it wasn’t quite what I’d been looking for but the simplicity, clean lines and smooth leather really caught my attention. So did the 4.7 star rating and 1240 reviews! 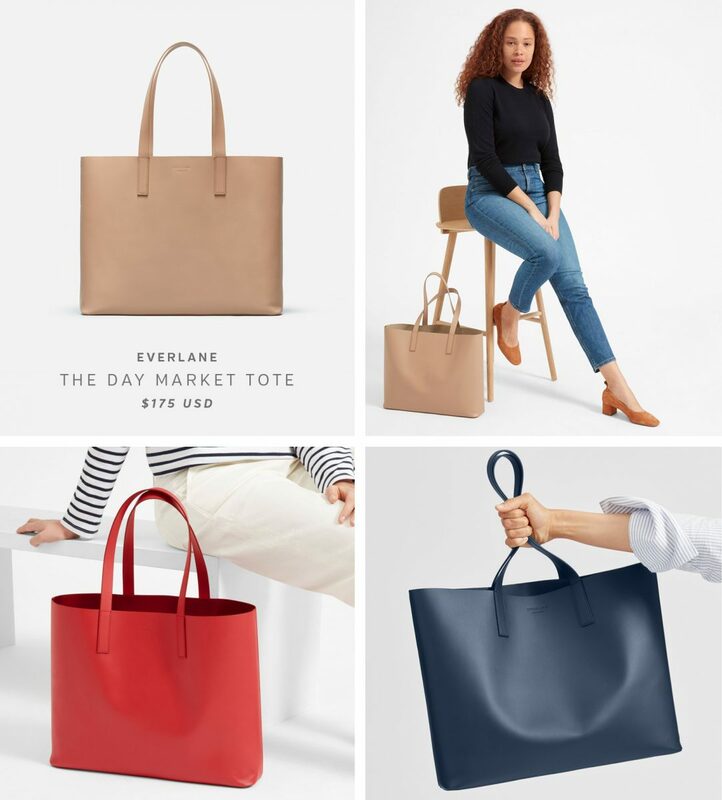 I’ve personally found that Everlane’s leather goods are high value for the price and quality so I felt this was worth including in case you’re not in need of a zippered option. Plus, there are lots of great colours! Thanks for tuning in! 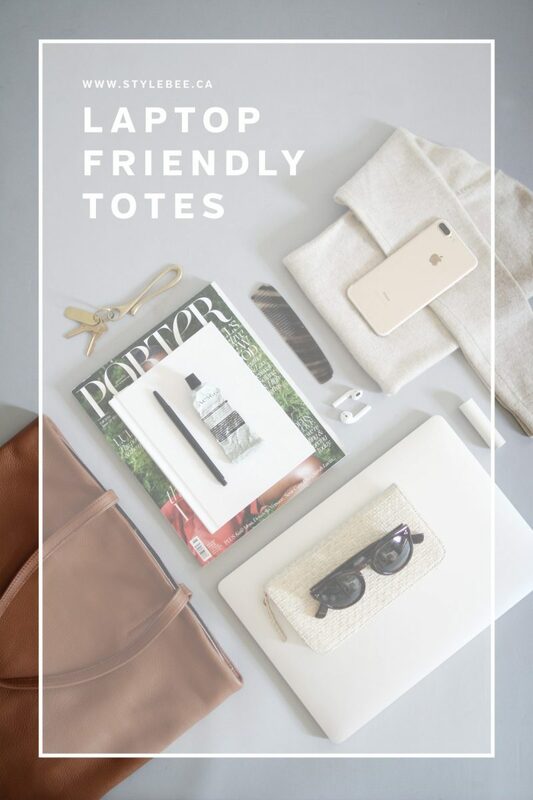 I hope this is helpful for anyone on the hunt for a laptop friendly tote. If you have any additional suggestions please let us know in the comments! 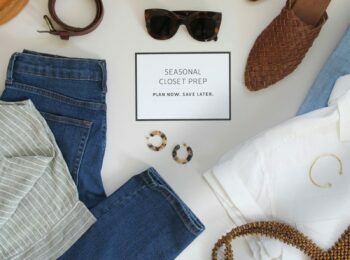 I’ll be back on Monday with 5 new looks and tips to transition your summer favourites into your fall closet. This post is not sponsored or produced in partnership with the aforementioned brands but it does contain affiliate links. When you shop via the links above I may make a commission on a sale. Thanks for supporting Style Bee! All opinions are always my own. This is a totally random non-fashion related question but! What do you think of the airpods? I’m planning to buy a pair but have an irrational fear of them falling out and losing them! I had that same fear Linn, but now I can honestly say the AirPods are a life changer. I’ve worn them for hiking, biking, jogging, yoga and flying (red eyes) and they’ve never fallen out. The sound is great and they work seamlessly with my phone so I would definitely recommend them! Just be prepared for weird looks if you take calls and they’re hidden behind your hair. Haha! 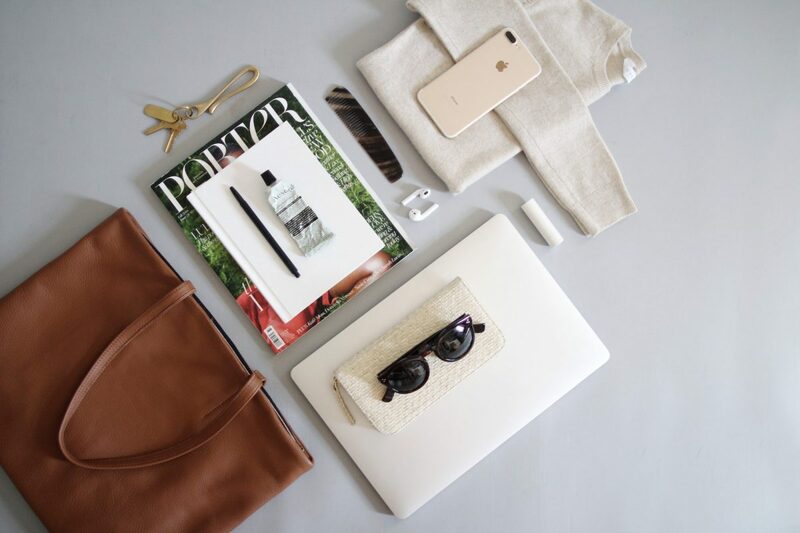 I love my Eden Carryall from Parker Clay! Thank you for this detailed post. I really admire your elegant style. I am wondering if you could share the source where you purchased your keychain. Love its style and functionality. I needed this post 6 months ago! 🙂 I decided on the Abera totenberg from ABLE and love it. The option of a cross body strap is great. And the leather is still beautiful, even after daily use. Great post! I loved the Matt and Nat bag, so I was looking on the internet and I found a disturbing article about worries me. 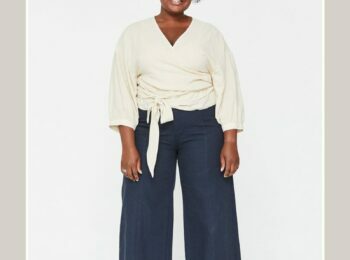 It’s from My Green Closet and the title is “Why I No Longer Buy Matt and Nat.” Have you heard of these concerns before? I thought I should ask you before making a decision on buying any of their products. Thanks! Hi Hillary, Thanks for sharing that blog post. I hadn’t seen it before but I tend to take everything I read online with a grain of salt, especially personal accounts. Until recently I hadn’t given Matt & Nat much thought as I knew their production was in China but having seen them frequent some of the sites I respect (ie: The Good Trade) I decided to look into them. 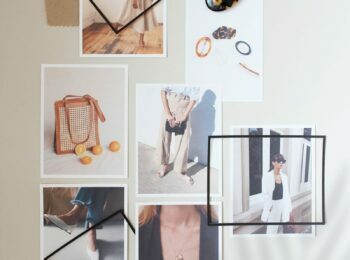 While they are not necessarily the most transparent about their supply chain, I do think the brand’s positive attributes outweigh the negatives, in particular for vegan leather alternatives (which is a request I get often). I’ve also seen their bags first hand and they are very high quality so I feel good about recommending them from that standpoint. 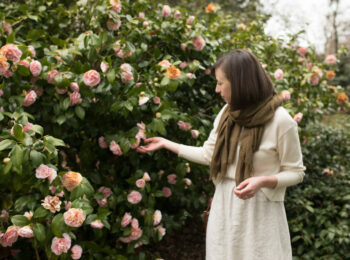 I also think they offer an approachable price point for their quality and values. 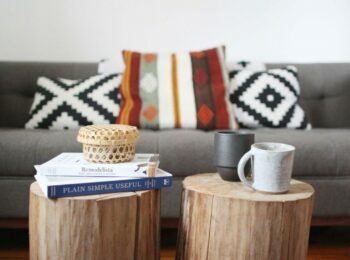 You can learn more about their Ethics & Sustainability, Materials and Transparency. 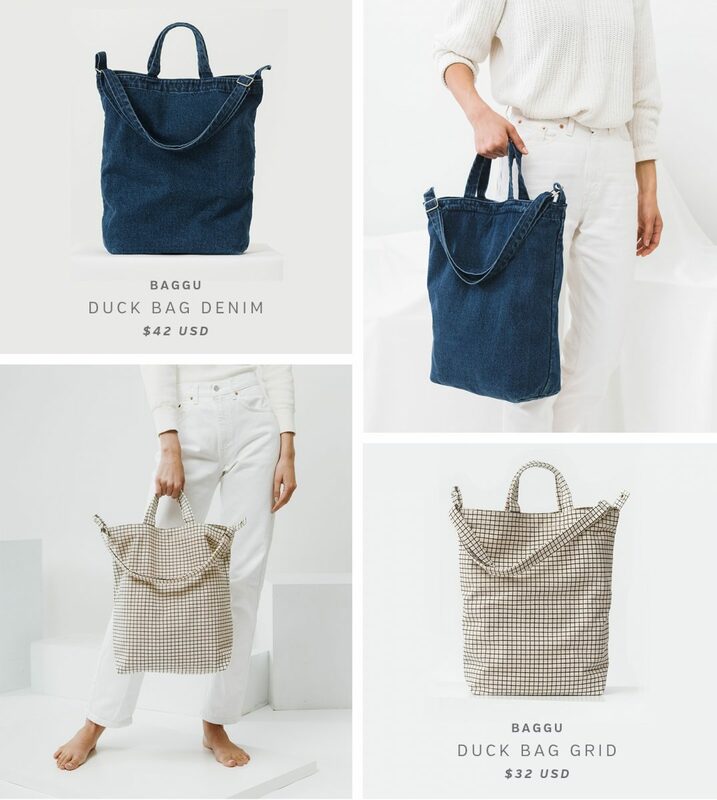 I just got the convertible tote/backpack from Eleventy Thirty (https://eleventhirtyshop.com/) as a work and general all-purpose bag and it is absolutely gorgeous – ethically sourced, local/made in Canada, zip closure and amazing quality. FYI! 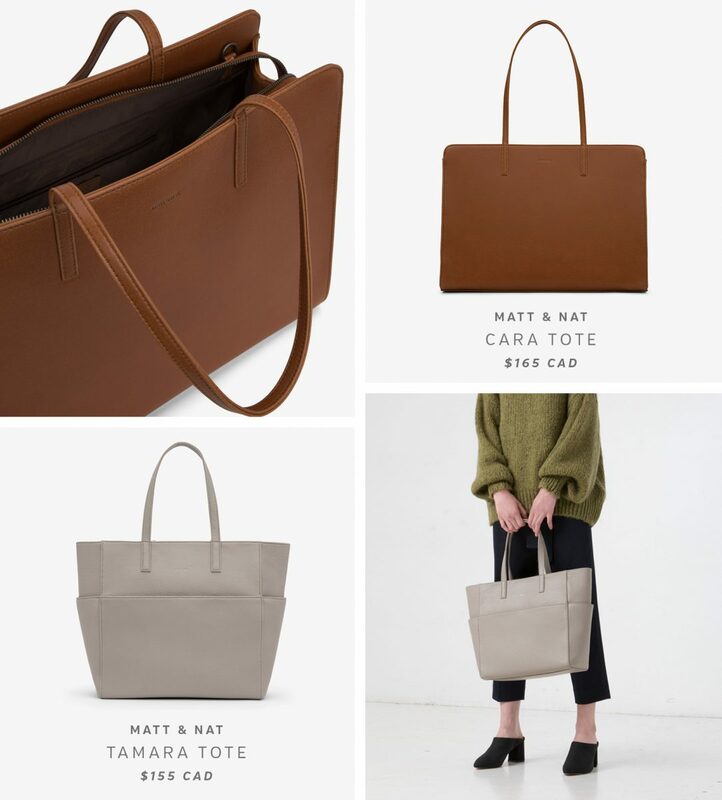 Great post–the Mindy Tote looks like exactly what I’ve been hunting for! But I’m wondering–do you know why the Tobacco color doesn’t seem to be shown on Opelle’s website? Is it sold out, or is it something they’re going to bring in soon? Thanks for your patience! Have a great weekend.